A modern take on country decor, the Tahoe 62 inch console has a versatile look and ample storage space to help you set up the perfect entertainment area for your home. 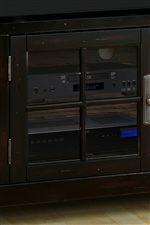 Two center wood-framed glass doors open to reveal one shelf, providing you with the perfect place to store media consoles like a DVD player or cable box, that's still accessible via remote control. Wood grilles on the center doors lend a classic touch, while tapered legs suggest contemporary styling. A wood door with panel detail sits on either side of the center doors, giving the piece a charming casual allure with more concealed storage space for other media accessories. A sound bar ensures your modern speakers have a home, allowing you to recreate the movie theater experience right in your living room. Two drawers and a Vintage Black Burnished finish complete the look, with simple round drawer pulls in a silver finish sparking a polished contrast. 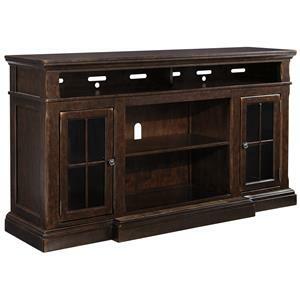 With smart storage and a truly versatile appearance, the 62 inch Tahoe console makes the perfect addition in any home. The Tahoe 62" TV Console with 4 Doors by Parker House at Beck's Furniture in the Sacramento, Rancho Cordova, Roseville, California area. Product availability may vary. Contact us for the most current availability on this product. Finish Finishes are crafted to give many years of enjoyment; all top coat sealers are lacquer based finishes and should be maintained with a soft cloth and a quality furniture polish. Finish & Paint Options Collection offers a Vintage Black Burnished finish that highlights a light to heavy rub-through on edges and high spots, as well as light to heavy physical distressing. Handles & Hardware Consoles feature round door and drawer knobs in a silver-colored finish. 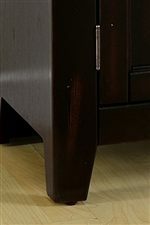 Case Detail Tapered legs support consoles, which also offer crown molding and wood grilles on glass doors. The Tahoe collection is a great option if you are looking for Transitional furniture in the Sacramento, Rancho Cordova, Roseville, California area.